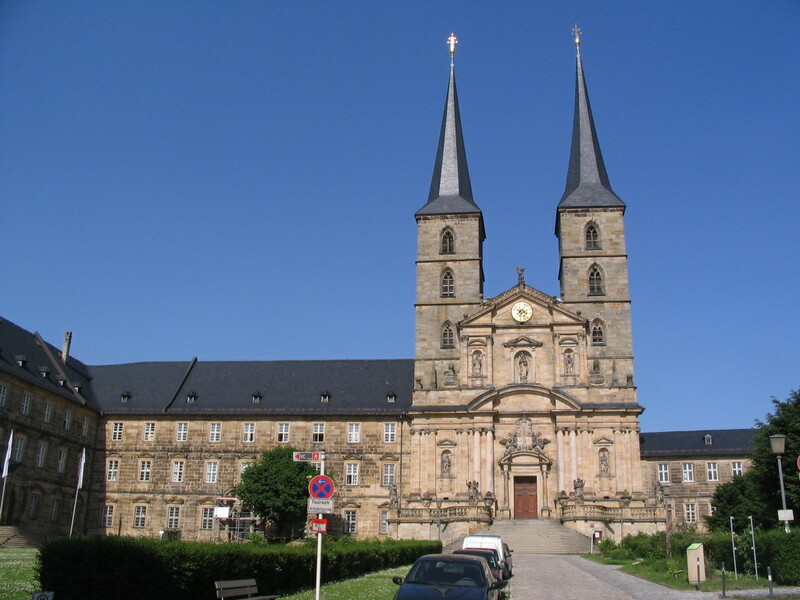 Michelsberg (or Michaelsberg) Abbey lies to the northwest of the Dom, and Michelsberg is another one of the seven hills of Bamberg. It was the most remote place I reached on the walk. 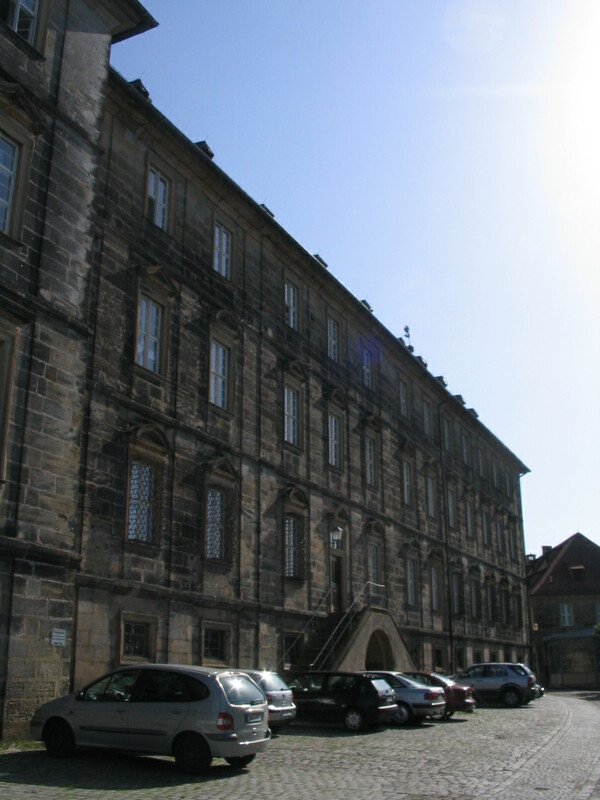 It was a Benedictine monastery until 1803 and then became an almshouse, which evolved into its current use as a home for the elderly. 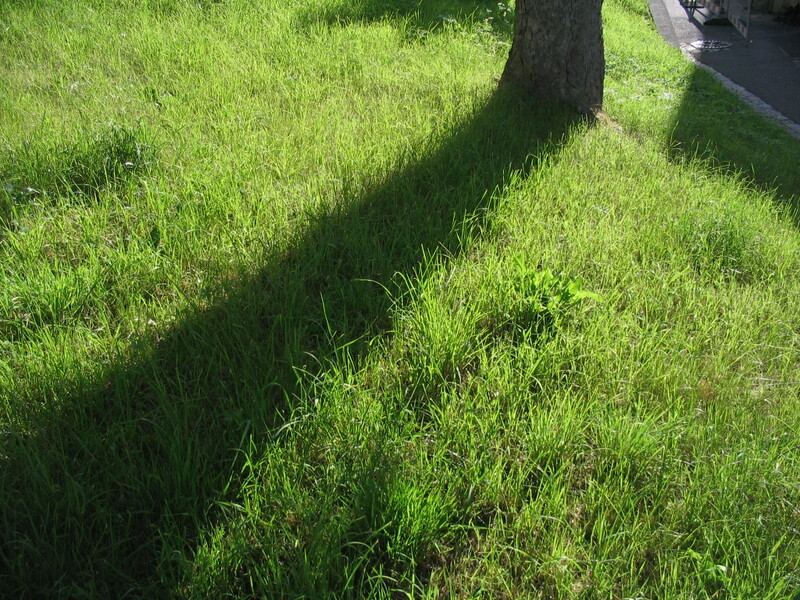 Along the way from the Jakobskirche, happy sunny grass. 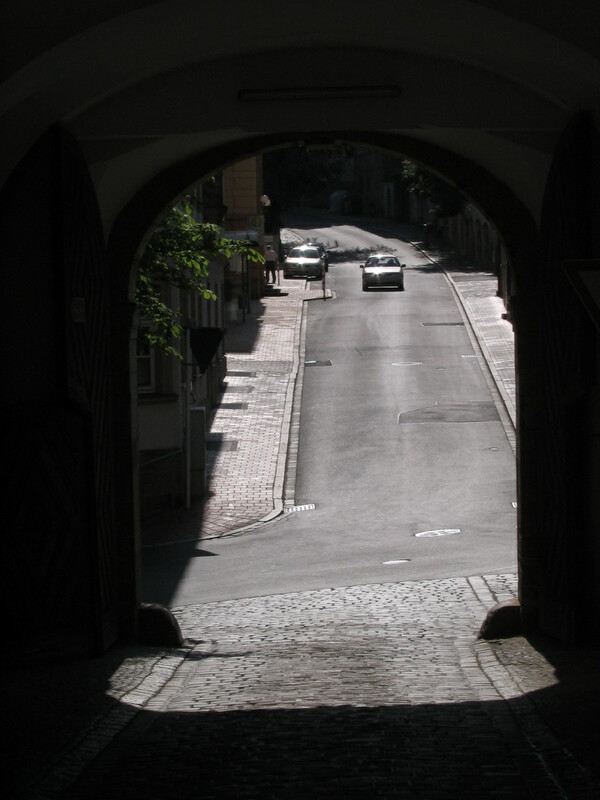 Through this curious aperture near Jakobsplatz is a secret view of Michelsberg and its steep front slope. 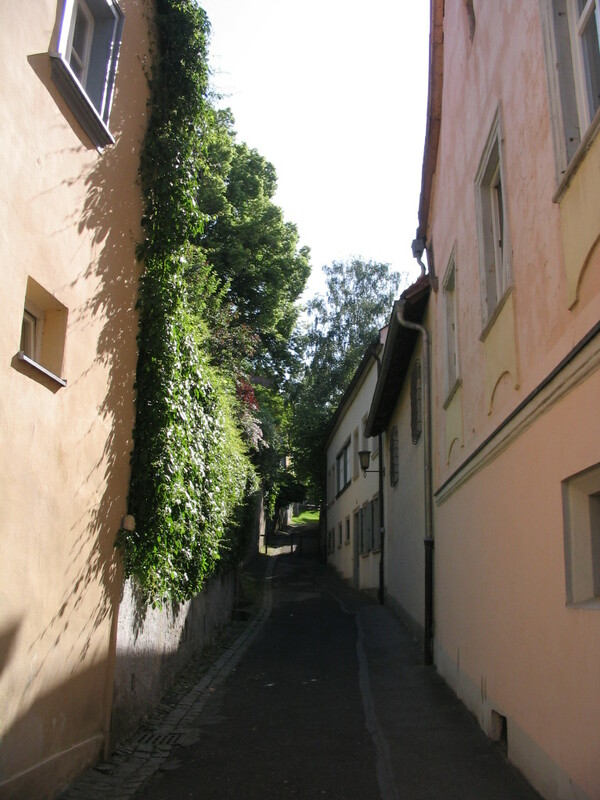 I proceeded down this delightful narrow lane, the Franziskanergasse. 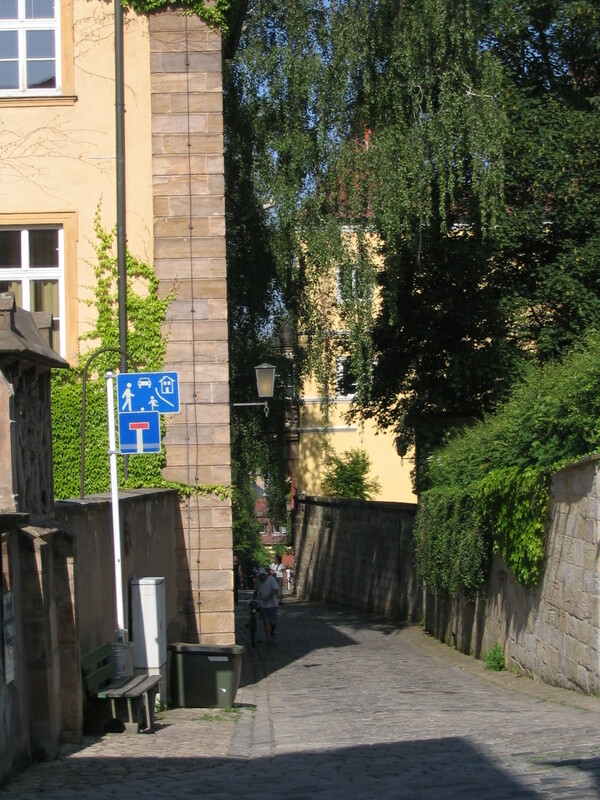 In urban design terminology, this street geometry is known as a "luge." Not really. Until now. 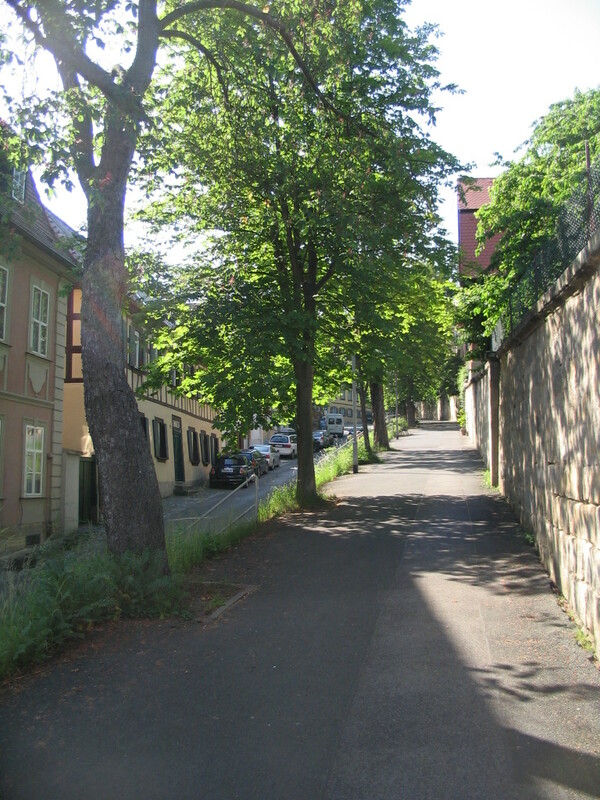 A look back up the lane at the lower end. Those hanging plants make it such a comfy-looking place. Meanwhile, time to get up the next hill. 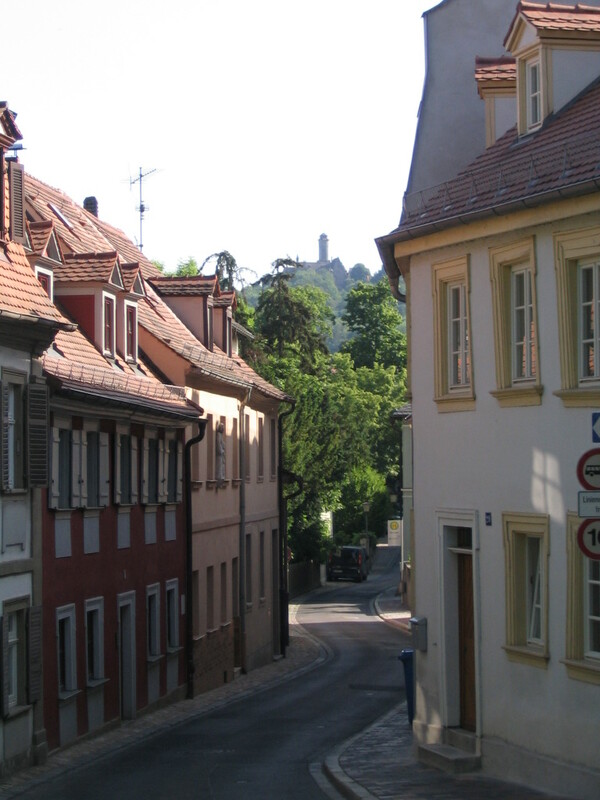 Way over yonder is the Altenburg castle, on the highest of the hills. I didn't have a chance to get to it. Next time, I hope. 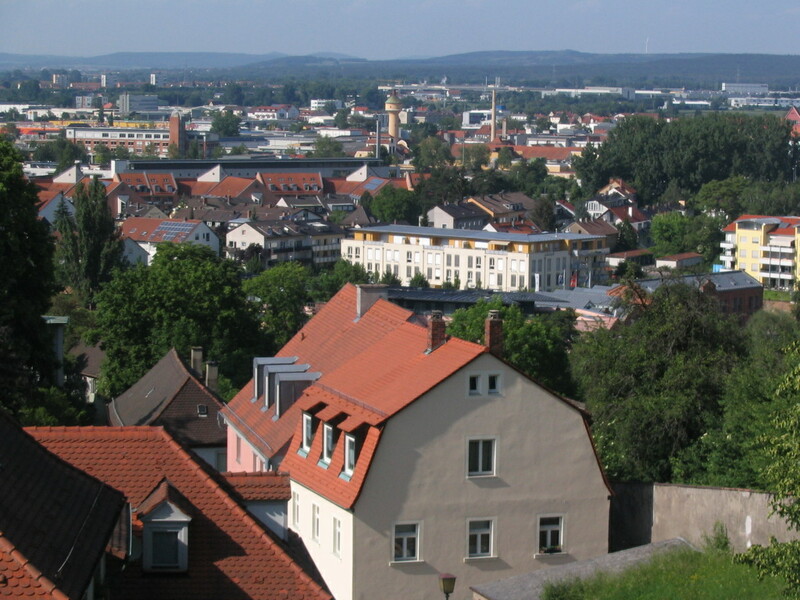 After a rather arduous climb, I reached the abbey; here is the view from the grand front yard of the Michaelskirche in the center. 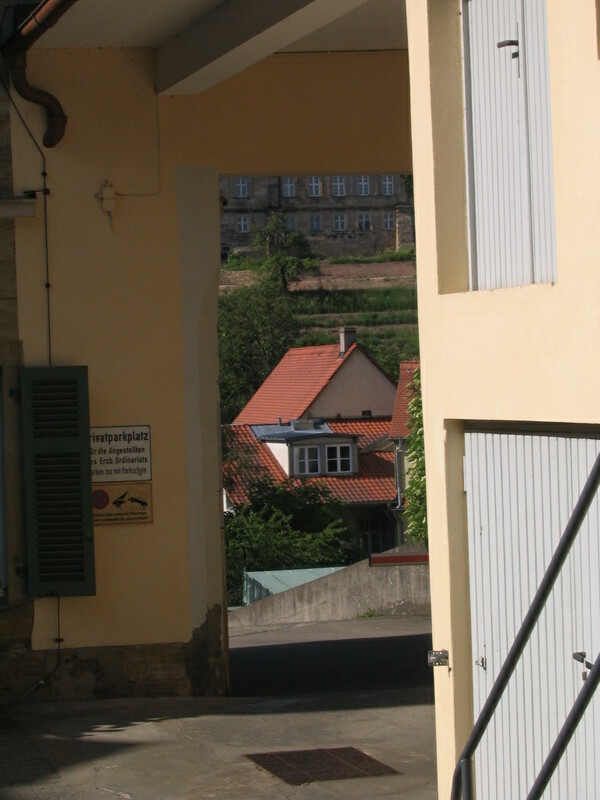 The entrance was through another wing of the abbey; this is a view back out, showing the street that leads away to the west, St. Getreu-Straße. 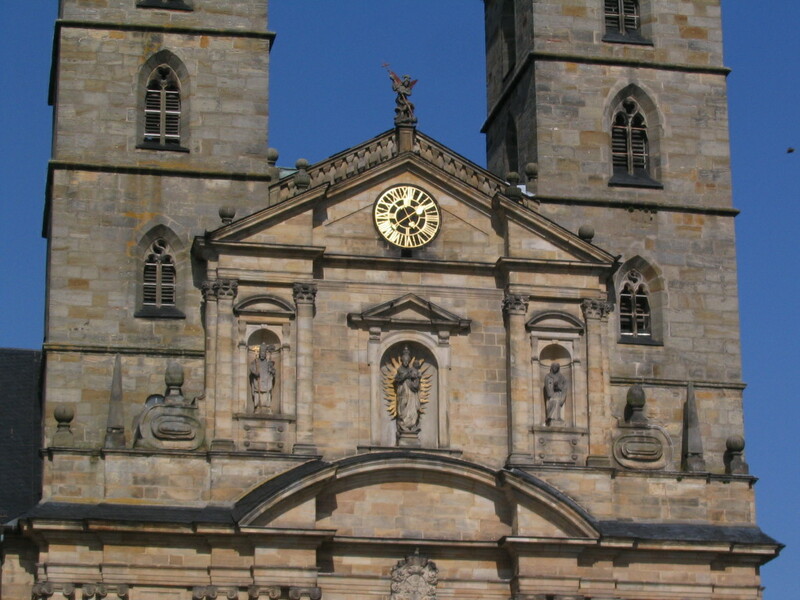 A familiar story by now: in the early 17th century the Romanesque church was rebuilt in a more modern style, in this case due to a fire. Here we have a mix of eras. 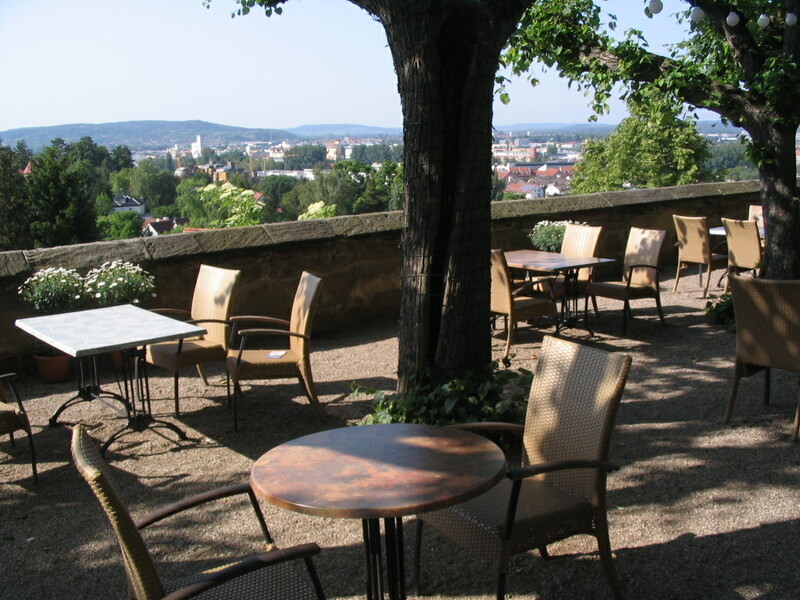 There was this expansive view out to the northwest, to the industrial areas downstream, and to the hills beyond. Is that a gigantic wind turbine on the horizon at right? 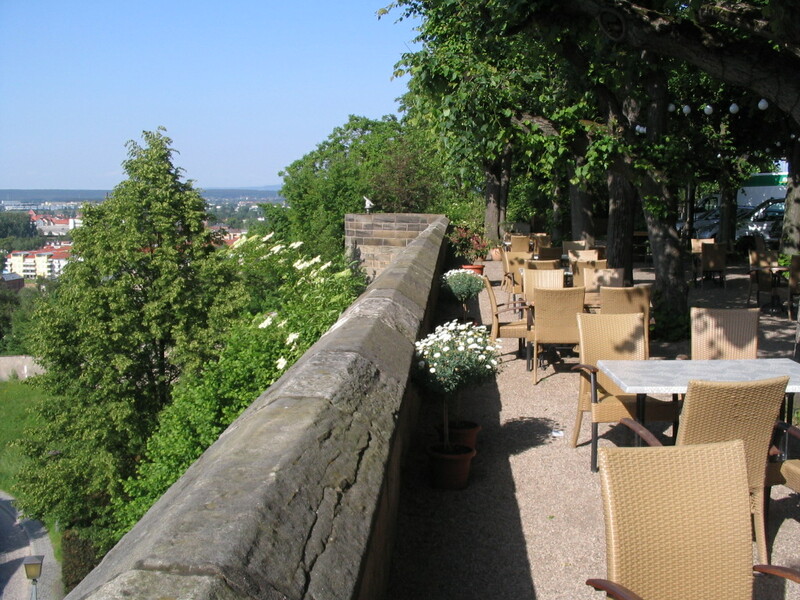 The view was from this lovely terrace at the northwest edge of the grounds. 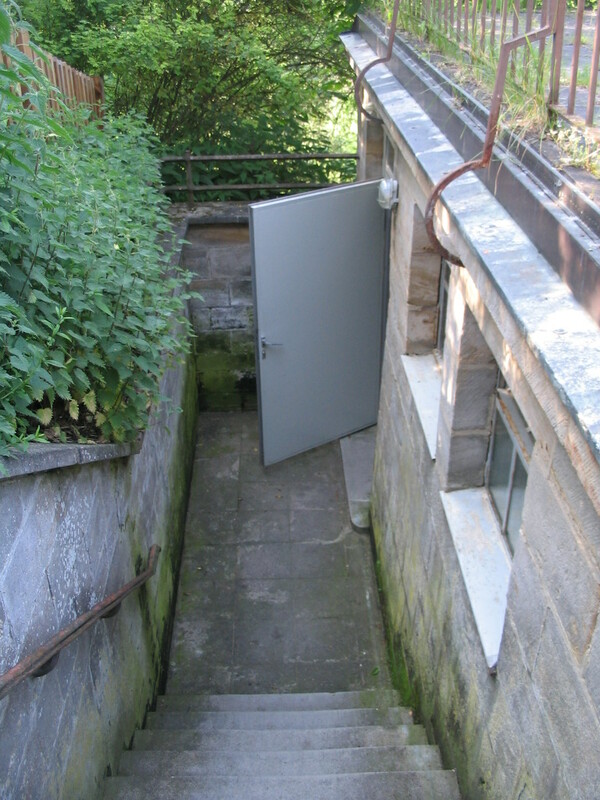 This restroom perched on the hillside was open to the public, and if I remember correctly, I was extremely grateful for that. 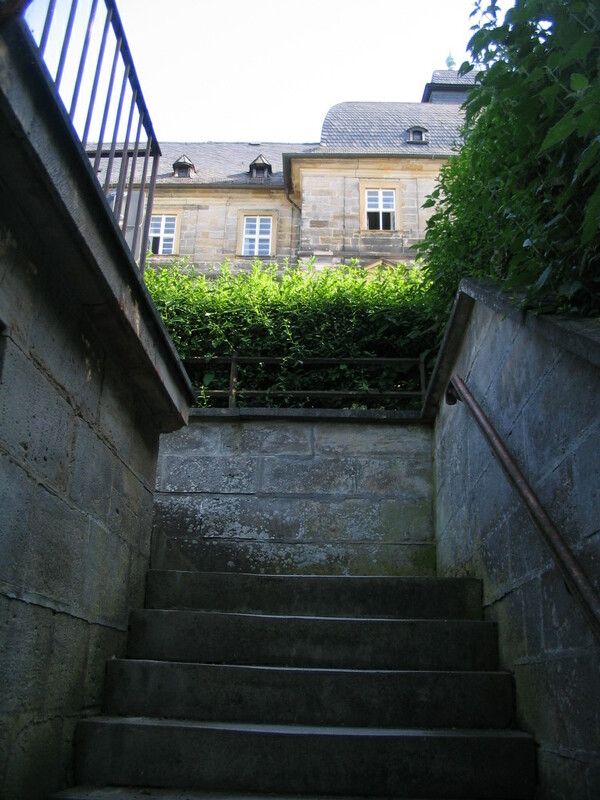 The abbey view from below. 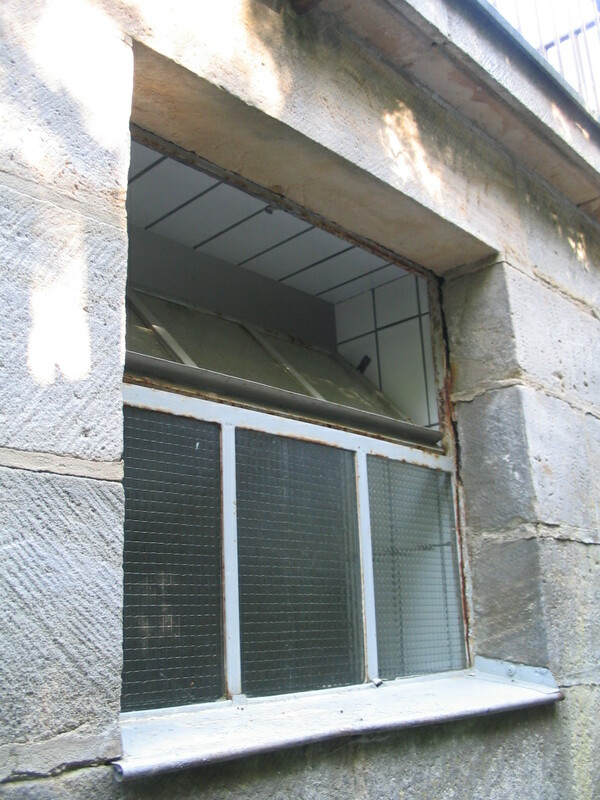 The north wall of the core of the abbey.